Vijaya Bank Issued a Advertisement For Recruiting 01 Advisor .All Eligible and Willing applicants Can Check Detailed Advertisement From Their Official Website And Apply Online On Or Before 09th December 2017.Eligible and Interested Candidates Can Check Detailed Information For Each Postion Such As - Eligibility Criteria, Qualifications, Age Limit, Selection Procedure Before Applying. Age Limit - Candidates minimum age restrict 45 Years to top age restrict 65 Years As On 01-11-2017. Salary And Grade Pay Scale- INR Rs.75,000/- Per Month. Educational Qualification - Candidates Must Pass Graduation Degree in any discipline or its equivalent qualification from a identified Board / University. Address -The Deputy General Manager-HRD Vijaya Bank, Head Office #41/2, Trinity Circle, M.G. Road Bengaluru-560001 . Important Dates -Last Date for Registration of Online Application Form Is: 09-12-2017 . 1.Click Here For Vijaya Bank Recruitment 2017 Detailed Advertisement. 2.Click Here For Application Form. Vijaya Bank Issued a Advertisement For Recruiting 01 Chief Statistician.All Eligible and Willing candidates Can Check Detailed Advertisement From Their Official Website And Apply Online On Or Before 31st August 2017.Eligible and Interested Candidates Can Check Detailed Information For Each Postion Such As - Eligibility Criteria, Qualifications, Age Limit, Selection Procedure Before Applying. Vijaya Bank Recruitment 2017 Detailed Advertisement. Vijaya Bank has published recruitment notification for 44 Probationary Manager posts. All eligible and interested candidates can apply online or before 09-01-2017 More detailed information on qualifications, age limits, selection procedures, exam patterns, syllabus for the Vijaya Bank Recruitment 2017 - 44 Probationary Manager Post is mentioned below. Age limit - maximum age for applicants should not exceed 45 years (Post 1), 35 years (Post 2,3). Age relaxations apply according to the rules. Educational Qualification - Candidates should graduate Degree / Postgraduate Degree / LLB or equivalent qualification from a recognized university. Selection Procedure - All eligible candidates will be selected for their performance in the written exam, interview, group discussion. How to apply - All eligible applicants and interested candidates can fill the online application via the official website http://www.vijayabank.com. Upon successful submission of the application, the applicant must send a written copy of the application together with relevant certificates to the following address before or on 9 January 2017. Address -Vijaya Bank, PO.BOX No. 5136, G.P.O. Bnagalore - 560001. The start date of the online application form is 19-12-2016. End date of filing Hard Copy of Application Form is: 16-01-2017. Deadline for submitting the online application form is (remote areas / areas): 20-01-2017. 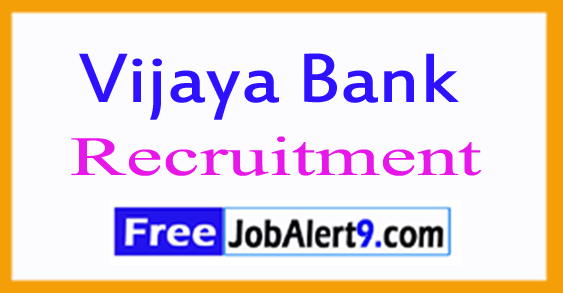 Click here for Vijaya Bank Recruitment 2016 Detailed ad.